CFS Tax Software, Inc. is a leading developer of tax utility software for tax professionals. Each year, over 30,000 tax and accounting firms across the United States trust CFS for affordable, high-quality, and reliable software. 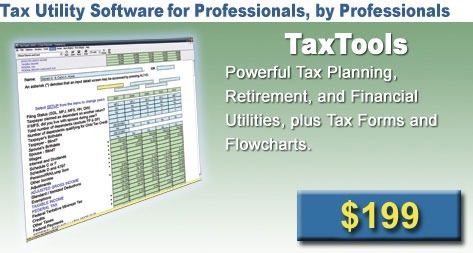 Our flagship product, TaxTools, is the best-selling program of its kind. 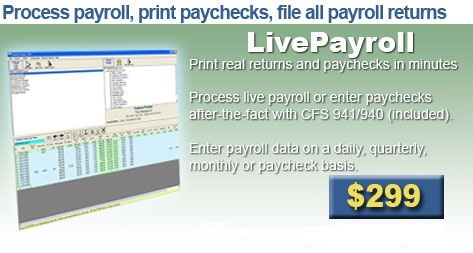 We also offer Payroll System, which is a suite of programs for processing payroll, W2s, and 1099s. 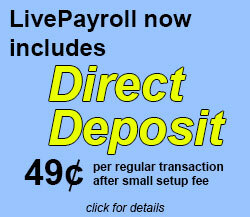 We also provide a complete line of tax forms, folders, and checks. For a complete listing of our products, click here. 04/01/2019: Payroll System 2018 was updated on the web to version 18.151. 03/12/2019: Payroll System 2019 has been updated on the web to version 19.031. 02/27/2019: The initial release of MD Personal Property 2019, verson 19.021, is on the web for users to download. 01/30/2019: Payroll System 2018 has been updated on the web to version 18.132. 01/23/2019: NY Sales Tax Preparer 2018 was updated on the web to version 18.131. 01/14/2019: CA Sales Tax Preparer 2018 was updated on the web to version 18.131. 01/14/2019: Payroll System 2018 has been updated on the web to version 18.131. 01/04/2019: Payroll System 2018 has been updated on the web to version 18.122. 12/27/2018: NY Sales Tax Preparer 2018 has been updated on the web to version 18.121. 12/27/2018: The initial releases of Payroll System 2019, TaxTools 2019, W4 Calculator 2019 are available to download. 12/11/2018: The initial release of Tax Corresponder 2019, version 19.011, is on the web for users to download. 11/09/2018: CA Sales Tax Preparer 2018 has been updated on the web to version 18.111. This is the 4th quarter update. 11/01/2018: NY Sales Tax Preparer 2018 was updated on the web to version 18.101. 09/24/2018: NY Sales Tax Preparer 2018 was updated on the web to version 18.091. 09/04/2018: Financial Planning Tools 2018 has been updated on the web to version 18.081.